This was followed by brief orientation remarks by a headmasterly Amin Husain. Citing the core principles of OWSDS — education, empowerment, imagination, action — Husain emphasized the importance of creating space for everyone to “step up” in the planning and execution of direct actions, rather than relying on the same familiar faces to lead. Next up, a group of facilitators ran through several “invisible theater” scenarios for disrupting business as usual in a bank lobby — ranging from slowdowns with the teller, to a group “melting” into a die-in on the floor, to going “civilian” by instantly snapping out of collective activity and disappearing as individuals into the normal flow of urban life. The latter tactic was critical to the next step of the OWSDS program at Bryant Park. The large assembled group broke into four action-teams consisting of 15 to 20 people, with each team responsible for filling necessary roles like scouting, communications, flyering and documentation. But there was a twist: The precise location of the targets for the actions were not revealed to the teams until the very last moment, and, rather than approach the targets with a raucous march that would draw an immediate confrontation with police, the teams were to make their way in civilian mode to their targets, where they would re-converge for the planned disruption. One action, for instance, was at a branch of Wells Fargo, a major recipient of bailout money and a key investor in the private prison industry. Protesters gathered there one by one, with a few police officers unsuccessfully attempting to follow them as they made their circuitous way to the target; around a dozen went inside and began to speak loudly on their cellphones about the illegitimate practices of the company, gradually escalating into a disruptive cacophony, while others moved the lobby furniture around the space. Meanwhile, some members of the team documented the action, while around 10 more picketed and flyered outside. Employees and customers of the bank were variously curious and flummoxed, and before any confrontation could take place or police could be called to the scene, the exercise was over. Twenty minutes later, all the action groups made their way in civilian mode to Times Square; there, marking a first for Occupy Wall Street, demonstrators were able to position themselves on the steps of the red amphitheater, where they unfurled banners and performed “The People’s Alarm,” a reiteration of the People’s Gong, but addressed to specific site of Times Square (which they called the “Fantasy Factory of Wall Street.”) From Times Square, the entire group marched together back to Bryant Park, where a debriefing was held and the planning process for the subsequent week was handed off to a new, self-selecting group of volunteers with varying levels of experience. Participating in the meeting — but stepping back considerably — were the organizers from the previous week. As the debriefing and planning meeting unfolded, a primary principle of OWSDS became clear: The success of these introductory training exercises would be judged not so much on whether they achieved any immediately measurable political result but, rather, on how effectively people were able to plug into the overall process of learning, organizing and confidence-building. While the action-planning group met, Occupy University held two classes (“Poetry and Political Feeling,” “Radical Economics”), and the National Lawyers Guild facilitated a know-your-rights training. All in all, by late afternoon, around 200 occupiers had gently taken over the corner of the Bryant Park lawn in a total of four simultaneous assemblies, with many others casually mingling and lounging among other users of the park. Festive displays, small-scale disruptions, temporary pop-up classrooms in recreational spaces — from this account, OWSDS might sound surprisingly “soft” for a movement that a month ago was calling for citywide general strike. But OWSDS speaks to the core radicalism of the movement with its emphasis on empowerment, skill-sharing and horizontal pedagogy. A major challenge of OWSDS will be to remain accessible with a wide spectrum of entry points, while nonetheless fostering an ethos of militant courage. Indeed, students are encouraged to develop “personal escalation calendars” tracking their progress in over the course of the summer. Citing a quotation from Henry David Thoreau — “Disobedience is the true foundation of liberty” — the educational rubric of OWSDS echoes the rich history of activist counter-institutions such as Freedom Schools of the 1960s and the Boot Camps of the Ruckus Society. 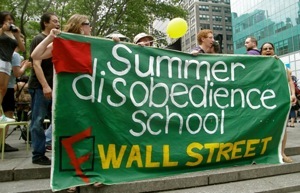 Most immediately, though, the Summer Disobedience School is an extension of the movement’s own weekly Spring Training exercises in the financial district during the build-up to May Day. The lessons of May Day will likely be major points of reference as OWS begins the planning process for September 17. Organizers are anxious not to let institutional coalition partners pull Occupiers’ energy away from more radical disruptions. But while there can be real tensions between affinity-group actions and broad-based, May Day-like coalitions with other organizations, they are not mutually exclusive. OWSDS could function as a platform for developing new creative tactics for people in existing campaigns wishing to move into more disruptive territory than usual — perhaps building on the connections forged around the 99 Picket Lines project, for example. In what was perhaps a strategic move to protect September 17 from being preemptively branded by Occupy’s allies on the institutional left, a short but dramatic call went out in mid-May for all Occupys to converge on New York for a “Black Monday” shut-down of the financial and commercial hubs of Manhattan. This is a task well-suited to OWSDS, given its geographical diversification beyond the Financial District, based on the recognition that “Wall Street is everywhere.” The name “Black Monday” strikes a dark note of crisis and uncertainty, yet it is also compelling in its deliberate emptiness, its sense of an imaginary void waiting to be filled by an unforeseeable diversity of actions and voices. Whoever or whatever it involves — debt-slavery is well-poised to become a major connective issue between students and other sectors, for instance — Black Monday will be above all an occasion to celebrate the revolutionary crack in the system that the movement has effected, and the other worlds that it is in the process of building through the principles embodied by the Summer Disobedience School. Seen in this light, Black Monday is less an all-or-nothing messianic endgame than just one more in an ongoing series of teachable moments. In these, any opposition between means and ends, tactics and strategy, and internal culture and outward-facing movement-building breaks down, creating a continuous fabric of education and liberation. I continue to hope that OWS will get behind the Progressive Populist movement and we can start electing Progressives. Progressives continue to be the only ones in government that have the interests of the people at heart! I wouldn’t hold your breath, at least as far as OWS in New York. OWS seems to be more interested in building grassroots power outside of the electoral political system, forcing elected officials to listen to it, rather than to enter the system itself. It seems, however, that in other parts of the country, Occupiers are more open to the idea of putting forward candidates. Still, the strategic question remains: in an electoral system so completely dependent on corporate and individual wealth, would it even be possible for a candidate to stay true to the movement’s values and have any chance of winning? An occupy-affiliated movement should field candidates that can be trusted. Otherwise we’ll just get politicians’ lip service. It amazes me that people still continue to believe that any change can occur within the political system. You probably voted for Obama. He promised to raise the minimum wage and help people get jobs, but instead continued to pay blood money to the banks and oil companies, and allow more and more jobs to go overseas. He has an abysmal human rights record – perhaps one of the worst in the history of the presidency. He made an end-run around congress to give $1.5 billion to the Egyptian military to support their repression of democracy after the uprising. Need I go on? If you continue to believe this naive fairy tale, you are doing exactly what the government expects you will do. Brainwashing at its finest! and finally got the bravery tto ggo ahead and give yyou a shout out from New Caney Texas! Just wanted to say keep up the greatt work!